With the launch of the iPhone 8 and iPhone X, Apple added inductive wireless charging support to its mobile devices for the first time. While the feature brought Apple's phones up to speed with existing Qi-compatible charging standards, the announcement fell short of some expectations that this year Apple would introduce technology allowing iPhones to be powered wirelessly at a distance, rather than having to use a charging mat. 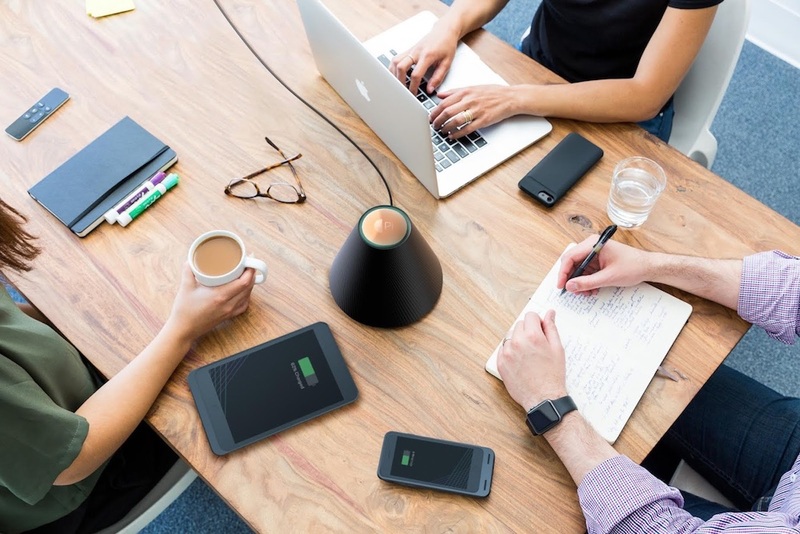 However, Pi is a California-based startup that aims to break from that limitation with the Pi Charger – a cone-shaped tabletop device that combines Qi-based resonant induction with a special beam-forming algorithm that allows it to charge multiple devices within about a foot in any direction. The Pi might not reach the distances claimed by Energous' WattUp technology, which uses radio frequencies to charge devices from up to 15 feet away, but it does offer more flexibility than existing pads that devices must be directly placed upon. In a demo at TechCrunch's Disrupt event, the company showed that up to four Qi-compatible devices can be placed within a foot of a Pi and they will start charging. Devices can be located anywhere within a 12-inch sphere of influence around the charging hub and in different orientations. The closer the device to the Pi, the faster it charges, with a gradual drop-off in charging speed the further away the phone is. "Magnetic fields are the best way to send meaningful energy to phones, tablets, and other portable electronics," said Lixin Shi, Pi's CTO and co-founder. "The hard part was figuring out how to make magnetic charging more flexible, multi-device, and extend its useful range. It took us over a year to complete the mathematical proof that makes it all possible." The team behind Pi said they've yet to settle on an exact price for the charger, but they expect it to ship for under $200 sometime in 2018. As for Apple, there is plenty of anecdotal evidence to suggest it has partnered with Energous to work on bringing a truly wire-free, over-the-air charging technology to its consumer devices, but we'll likely have to wait for at least another year to see the possible fruits of those labors. Not a single mention of health risks... that's reassuring. We'll find out it somehow causes cancer in 20 years. After congressional testimony from expert witnesses saying it doesn't. After countless articles assuring us it's "safe". Only admitted once a bunch of people are affected. And suited for current iphone 8's and x's! This is awesome tech and hope to see this become a reality! One wonders if this will effect sperm count. Are there any studies on this BruckU? One 2-hour charge is equal to a 12-ounce serving of Nuka-Cola Quantum, but the rads are totally worth the convenience. I really wish you could buy the raw induction coils with a USB connector so you could make your own in furniture stuff a bit better. I'm not interested in the charging mat thing at all - but if I can hide induction charges in multiple furniture places and in places in the car, that makes it much more useful. I don't want to have to buy 5 pad charges to take it apart to cover the entire arm of my sofa though! I am in an odd spot about this. I am not comfortable with more RF / EMF surrounding me while I go along with my day, but, I want the simplicity some of this technology brings us. Be curious to see the exposure calculations of these devices within confined spaces. Some HAM radio chat posts show that Qi chargers from Anker produce interference to HAM equipment in frequencies that have nothing to do with inductive charging. In short, they are emitting RF within parts of the spectrum they don’t have approval for. Not enough to violate their part 15, however as devices age, or, cheap copies come out, there could be other issues down the road. I am not worried about people having accidentally microwaved their puppy, but, stray RF can do some strange things to other devices, and the human body. Will be nice to see how this tech shakes out, but I am hoping the FCC is keeping a close eye on what they can.